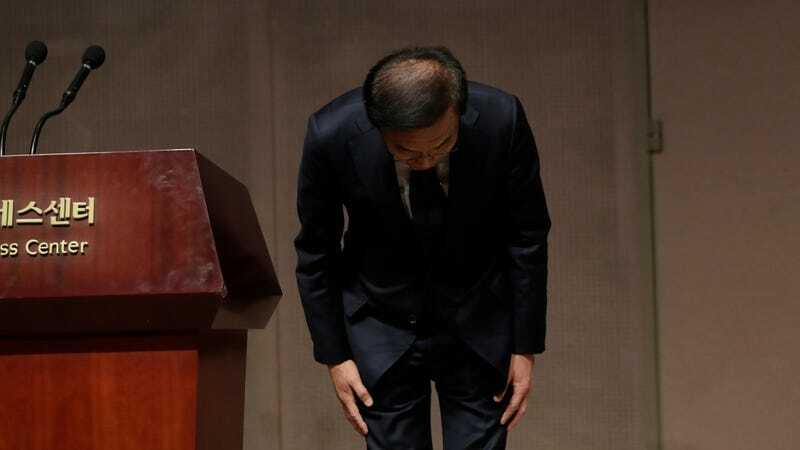 Kinam Kim, President & CEO, Device Solutions, Samsung Electronics bows in apology in Seoul, South Korea. Samsung has issued a formal apology to its workers who were sickened and died at its chip and display factories. The apology arrived as part of a settlement the company reached with victims of maladies that reportedly included cancer and miscarriages. “Our effort was insufficient to better understand the pain affected workers and their families went through,” Kinam Kim, president and CEO of the company’s Device Solutions Division, said during the public apology this week. The Associated Press noted Thursday that one glaring absence in Samsung’s apology was an admission that its own workplace conditions led to illness or death suffered by its workers. Horrifying allegations of toxic work environments have plagued the company for years, with Samsung finally agreeing to a compensation deal with its factory workers in July. Reuters reported Thursday that the South Korean manufacturer agreed to pay victims of illness suffered by exposure to chemicals at its factories up to 150 million won (roughly $132,289) by 2028. Hwang Sang-gi, whose daughter worked at one of Samsung’s factories and died of leukemia in 2007, is the founder of the South Korean advocacy group Sharps and told Reuters that as many as 200 workers at Samsung’s factories were sickened, with 70 of those individuals later dying.